It would be awesome if we could get some rotational tools for our objects! Double triple PS, is it at some point possible to move the Cages and the Lums that spawn from them? I've been able to successfully move the Yellow Lum that comes from the very first Cage of the game in the Woods of Light, but no others seem editable. What's more, the Cages themselves don't appear to be loaded object yet. Is this because they are objects that cannot be identified by the Editor yet, or are they simply not objects at all, but rather, scripted/hard-coded into the game in some way? The same question about Flipswitches, really. Ah I've noticed that, in general, there's still a number of objects that is either plainly not imported yet (missing some Yellow Lums here and there), or uneditable (no coords/world position). I bet that's still a hack-in-progress, then. Shrooblord wrote: Double triple PS, is it at some point possible to move the Cages and the Lums that spawn from them? I've been able to successfully move the Yellow Lum that comes from the very first Cage of the game in the Woods of Light, but no others seem editable. What's more, the Cages themselves don't appear to be loaded object yet. Is this because they are objects that cannot be identified by the Editor yet, or are they simply not objects at all, but rather, scripted/hard-coded into the game in some way? The same question about Flipswitches, really. The information I'm getting from the level files may be objects supplied with additional debug information, because the importing algorithm I'm using isn't actually skipping out on any objects laid out like the ones it's importing are. That's all of them. My guess is that all the objects and coordinates are still located in the SNA files, but the ones without said debug information are packed together in a much less-readable way. Rayman 3's objects have a similar layout, but there are no (string) names attached to any of the objects, and I can't find a suitable entry-point for each object, meaning it might be a little more difficult. Though I only spent like half an hour looking at Rayman 3 in total. I also noticed that some Flipswitches (like the one in the Fairy Glade #3 that opens the laser barrier) can be moved, while others (like the one in the Fairy Glade #1 that opens the Baby Globox gate) are not visible in-Editor (yet). And I remember you mentioning something about Robo-Pirate spawn locations being inaccessible. Is there any light you can shine on this? What do you think makes these locations so hard to determine/manipulate from/in the SNA files? 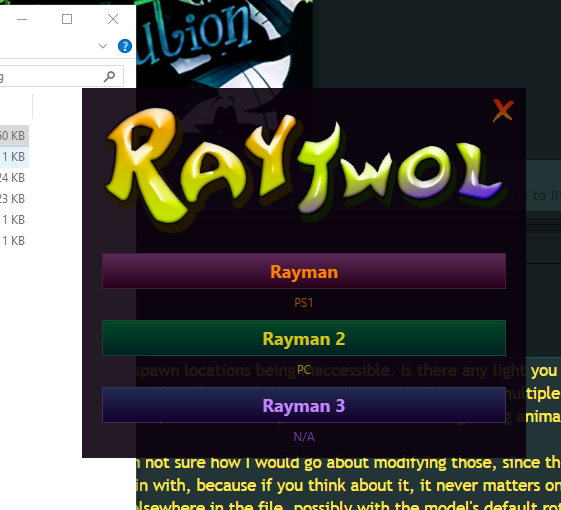 Adsolution wrote: Hey people, I'm working on a Rayman 1-based RayTwol as well, currently for editing the PS1 version. Amazing, that reminds me of the good old times when I'd create levels in Rayman Designer with the Mapper. That's probably what the name of the new tool should be based on: Mapper. I was thinking of something that would emphasize the fact that it's a new mapper but I can only think of terribly edgy names. Shrooblord wrote: And I remember you mentioning something about Robo-Pirate spawn locations being inaccessible. Is there any light you can shine on this? What do you think makes these locations so hard to determine/manipulate from/in the SNA files? I have no idea really. There are multiple files comprising each level, and I've only explored the GPT and SNA files (the former in very little depth, but I know they contain information regarding animation/sub-model stuff). As for object rotations which you asked about earlier and I forgot to respond to, I'm not sure how I would go about modifying those, since there is no rotation stored where the positions are. I don't think most objects even have an orientation to begin with, because if you think about it, it never matters on an interactive level in Rayman 2, and visually, the models are re-defined every time said objects appear elsewhere in the file, possibly with the model's default rotation already baked into the vertices. Come on, that's such a bland name. Hunchman801 wrote: I was thinking of something that would emphasize the fact that it's a new mapper but I can only think of terribly edgy names. Though anyone is still free to convince me otherwise if they have any strong feelings on the topic. So how will level sharing work? Is it possible in its current state by copying the level files over? I would have thought some sort of level info file would be handy, like a data file that records changes you make in RayTwol or just a compressed "pack" of your edited levels and then you can load it similar to the hold and fetch system. Maybe that's not the best way to do it but it seems more intuitive than having to replace all the level files in your game folder, and that way you could load someone's whole edited game and afterwards load the default levels back easily. Lol ye, that was a pretty good name, no lie. I've thought about that briefly, and yeah, that would be useful. I could even make the program automatically import/export zip files directly, containing your modified game or level(s). I'll probably overhaul the UI a bit, which will include project handling. Adsolution wrote: Though anyone is still free to convince me otherwise if they have any strong feelings on the topic. Well it's a cool name indeed, though it has nothing to do with the new mapper. Not that I have a better idea anyway. Well, currently it's two tools in one, so RayTwol still works in that sense. Until support for Rayman 3 is added, that is. Good point. Ad, just don't get started on Rayman 3. Adsolution wrote: As for object rotations which you asked about earlier and I forgot to respond to, I'm not sure how I would go about modifying those, since there is no rotation stored where the positions are. I don't think most objects even have an orientation to begin with, because if you think about it, it never matters on an interactive level in Rayman 2, and visually, the models are re-defined every time said objects appear elsewhere in the file, possibly with the model's default rotation already baked into the vertices. I would like to argue that in specific cases, rotation is very important, like with the Fairy Glade #3's Iron Sparadrap door that leads to a Cage overlooking the waterfall area that's hidden behind the keg-tossing Henchman's little fortress. The rotation of that object had to be such that it aligns with the rest of the level geometry, so I guess it's defined somewhere. I refuse to believe that objects like the Sparadrap doors (of which there are actually two in quick succession of one another in the mentioned level area!) do not have rotational data stored somewhere. They need to align with geometry, and the objects need to know which direction to fly off in once the Sparadrap has been destroyed (a funny issue I have run into after placing it elsewhere: the door flies towards Ray who's tossed a powder keg into it instead of away from him because of the orientation the door was in originally). Sparadraps, which are always aligned with the objects they are attached to. Maybe that helps narrow down where the data could be stored? Or I don't know. Maybe it's not stored anywhere after all. But I just can't believe that's true. It would make no sense to me as a game designer if it is. Well, quite a few of those only appear once, so they could just have a built-in orientation. But for the others, yeah, of course. And switches too! And now that you mention Jano, are there any insights to be gained into why the hell he just moves across the map once you finish the CoBD? Yeah keep on dancing Rayman. Shrooblord wrote: I would like to argue that in specific cases, rotation is very important, like with the Fairy Glade #3's Iron Sparadrap door that leads to a Cage overlooking the waterfall area that's hidden behind the keg-tossing Henchman's little fortress. The rotation of that object had to be such that it aligns with the rest of the level geometry, so I guess it's defined somewhere. I refuse to believe that objects like the Sparadrap doors (of which there are actually two in quick succession of one another in the mentioned level area!) do not have rotational data stored somewhere. They need to align with geometry, and the objects need to know which direction to fly off in once the Sparadrap has been destroyed (a funny issue I have run into after placing it elsewhere: the door flies towards Ray who's tossed a powder keg into it instead of away from him because of the orientation the door was in originally). Almost every object has its model (and animations potentially) re-defined every time they re-appear, including the doors. Not a single object mentioned so far have rotations that affect the gameplay in any fashion whatsoever; they're all merely visual effects. Things like the rotating doors and fire jets in Stone and Fire probably just have animated collision geometry in addition to animated visual geometry. The next update will have some big new features implemented that will take a while to complete. I don't know. Talking about the editor towards Rayman 1, where's the progress on a beta version being released? Also, has an edited level been tried out on a PlayStation, and not through an iso file of the game? I don't have a chipped PS1/2 so I can't test it, but anyone else who does is free to give it a try. Absolutely no reason it shouldn't work. As for a release date, I'm not totally sure, but it is very functional in its current state. Just not complete. Adsolution wrote: Almost every object has its model (and animations potentially) re-defined every time they re-appear, including the doors. Not a single object mentioned so far have rotations that affect the gameplay in any fashion whatsoever; they're all merely visual effects. Things like the rotating doors and fire jets in Stone and Fire probably just have animated collision geometry in addition to animated visual geometry. Wow, really? How... old school. When you say redefined, do you mean that the model itself is hard-coded somehow? I.e. its shape and geometry (vertices in 3D space) are pieces of code rather than what we would nowadays expect from models as separate object files with rotational data inside a larger 3D environment? My dad always seems to bring that (and especially how hard it is/would be) up when we talk about 3D engines and making 3D games - I suppose that's because that's how they used to make 3D in the early days, which is when he was involved with the field.